Teral-aerotech offered a wide range of Man Cooler Fans and we use premium quality raw materials in the fabrication of man cooler fans which are acquired from some of the most reliable vendors in the market. Teral-aerotech man coolers manufactured carry distinctive value and appeal in the mind of our customers which makes them one of the most competitive products in the market. We offer a wide range of man cooler fans that differ in the mechanism of their working. Our man cooler fans product range include tubular, column and pedestal type designs which are differently designed to meet variable requirements in the market. 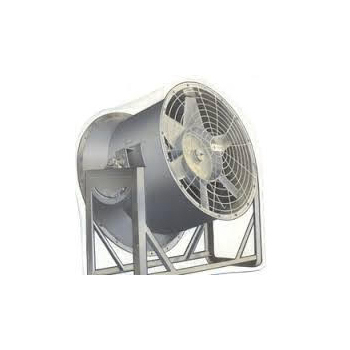 The Tubular Man Cooler Fans is mounted on a cradle with casing. Fitted with aerofoil blades of cast aluminum alloy, it is designed for high efficiency and long distance air throw. A simple mechanism allow you to adjust the air stream angle as required. Teral-aerotech fans are widely used in different industries. We manufacture the fans using high grade raw material that ensures better quality and durability. We do not compromise with the quality of these fans and so we test these fans on different quality parameters for flawless performance.